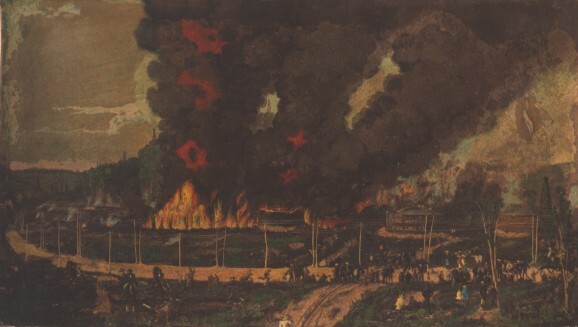 "An Oil Fire In The Oil Regions Of Pennsylvania"
The Rixford fire of May 9, 1880, originated in Squire Cline's office, and resulted in the destruction of seventy-five buildings, six loaded freight cars, twelve empty flat cars, forty oil rigs and 70,000 barrels of oil - the total loss being placed at $184,000. The old Rixford dwelling was swept away at this time, but although the fire surrounded it, John McKeown's well on Main Street was left untouched. On the north side, western end of Main Street, west of the point of origin, this fire destroyed Cronin's boarding house; Farley's dwelling; the Central House; Cline's office; Mitchell's grocery; the Waterman block; Mrs. Karn's jewelry store; Tuttle's fruit stand; the Seymour building; the Nast Bros.' building; A.J. North's; Krohn's clothing house; Steven's bowling alley; Otto's dwelling; Scoville's law office; Blue Front grocery; Baker's dwelling; Edmund's dwelling; Tait's photograph gallery; Wass' restaurant; Garvin's blacksmith shop; Gibney's shoe shop; Dana's billiard hall; Brundage's Bakery Hotel; McIntosh's boarding house; Crandall & Alderman's grocery; Goodenough's Scranton House; Shanbacker's Yeoman House; Tait's grocery; Farrell's boarding house; Ive's shoe store; Holmes', Porter's and Mrs. Barry's dwellings; Drach's laundry, and Curtis & Drake's Titusville House. On Railroad Street, extending north from Main, there were destroyed Horan's Hotel; Kane's restaurant; Mrs. Rockwell's Central Hotel; the dwellings of Crooker, August and Dean; Mrs. Robins' saloon; Gorley's Railroad House; railroad depot; Packard & Co.'s office; Youngstown Oil Company's office, and Culbertson's dwelling, while Allen's coal yard, McAndrew's boiler shop and E.S. Crooker's tank shop, west of the depot were destroyed. South of Railroad Street, U.T. No. 429 and No. 452 both of which 25,000-barrel tanks, and McLeod & Morrison's 7,000-barrel tanks burned. On the south side of Main Street, beginning on the west, there were destroyed Unger's clothing store; Wagner's meat market; the Rolph House; Wagner & Faught's Opera House; the O'Brien building; Kammacher's building; Royer building; John Faught's dwelling; Crandall's dry goods house; Dickenson's post-office building; Neilen's hotel (Bishop House); Fleming's tank shop; Robinson's glycerine office; William O'Brien's residence; Dibble's drug store; the Gleason House; Edward's livery stable; O'Brien's old Rixford House; John McKeown's office, and O. Fleming's dwelling. The work of rebuilding was begun on May 10 of that year.